Find Your Perfect Toyota – Hassle Free! Are you currently cringing at the thought of starting the process to find your next new or used car? There’s no doubt that car buying can turn into a headache, but at LeBrun Toyota, our team is eager and ready to alleviate that pain! The available options are endless when it comes to all the different models, trim styles, features and colors. With countless combinations possible, it makes it difficult for dealers to have every single option in stock. At LeBrun Toyota, we will connect you with your own Personal Auto Shopper who will focus on your needs and wants in your dream car. Tell us the model you have your eye on, whether it’s a new Toyota or a used car, your desired color and trim package, and every other safety and technology feature you would like it to be equipped with. Your Personal Auto Shopper will then search through thousands of vehicles within hundreds of miles just to find your perfect match. With the team at LeBrun Toyota, it’s just that easy! What’s your next step? Fill out the contact form below with your desired vehicle details then leave the rest of the work for your Personal Auto Shopper. Forget having to visit multiple dealerships or having to spend countless hours searching online for the perfect set of wheels. The best part of this deal? It all comes at no cost to you. Whether you’re looking for a Toyota dealership in Rochester, Canandaigua, Victor or any other surrounding area, we can help you. 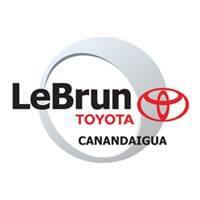 Let LeBrun Toyota show you how to find your next car, truck, van or SUV hassle free!